I was recently interviewed by ColantroCooks.com about Cooking, Entertaining, Kitchen Design, and Living – check it out below! Kiran Singh is a single mom, multi-award winner, and life coach who is passionate about inspiring others to be the designers of their lives. We had a chance to sit down with the creator of Passion for Food and ask Kiran about her cooking philosophy, Norwegian cuisine, and suggestions for dinner parties and kitchen designs. Tell us a little about yourself. With all of your other interests, how do you ever find time to do any cooking? I am a multi-award winning Mumpreneur who was born and brought up in Norway and is now based in London since summer 2008 with my lively 11.5-year old daughter (who is the Editor of I am My Mummy’s Happiness). I am a life coach at Design the Lifestyle YOU Desire, an author and residential/hospitality interior designer at STUDIO KIRAN SINGH, and founder and editor-in-chief of Vivacious Mum, My Unique Home, and Passion for Food. I run a local support group for single parents through Gingerbread. I am an expert at The Women’s Room and HerSay Expert. My empire is a lifestyle business, and Passion for Food is one of those components. I love food; in fact, I think I can call myself a foodie. I plan our weekly meals on a Sunday, do the shopping accordingly on (almost) a daily basis since I am fortunate enough to work from home, I make sure I cook healthy and delicious meals throughout the day. If we can’t make time to cook and eat (like the French do), what’s the point of working and earning money? Otherwise, in life’s hustle and bustle, we are too busy making a living and not actually LIVING. What is your philosophy when it comes to cooking and preparing meals? One of the things I LOVE about cooking is that cooking a meal is one of the most personal and intimate things you can do for someone. You’re literally providing plated nourishment made with your own hands and creativity – even if you’re following a recipe, you picked the recipe and planned the meal didn’t you? The specialness of a home-cooked meal is the feeling of abundance it provides; everything you have and need is right in front of you within arm’s reach. The fragrance of garlic, the crackle from the skillet, and the sight of perfectly roasted bird coming out from the oven…. DIVINE! Cooking speaks to all of my senses. It’s a joy I’m so proud to know! Since you were born in Norway, are there any Norwegian influences in your cooking? Oh yes! I do love my Norwegian food and I think at least 50% of my cooking is inspired by Norwegian recipes. In the beginning, I found it really hard to make some of my favorite recipes; but after loads of research, experiments, and improvisation, I finally have managed to get the taste and flavors approximately 80% authentic. I do miss Norwegian sausages, but found that Lidl, Morrisons, and Ocado do something with similar flavors. Your blog also talks about entertaining guests for dinner parties. What’s the most important thing to keep in mind when you’re preparing a meal for guests? For me, the most important thing is to leave the perfection and be authentic. Create an atmosphere and ambiance that’s relaxing and enjoyable. Let the food talk; food is, after all, memories. Sharing good food with friends and family is one of life’s great pleasures and gives us some of our happiest memories. My top tip: When cooking for friends and family, remember the most important thing is that they come over to talk to you, not to test your cooking skills. Keep it simple and get organized, and everything will go smoothly. Choose recipes you know you can manage in your kitchen with ingredients you know you can find. Read the recipes through before you start, refer to the work plan, then just relax and enjoy the shopping and cooking. Do you have a favorite recipe that you like to make when you are hosting people for dinner? 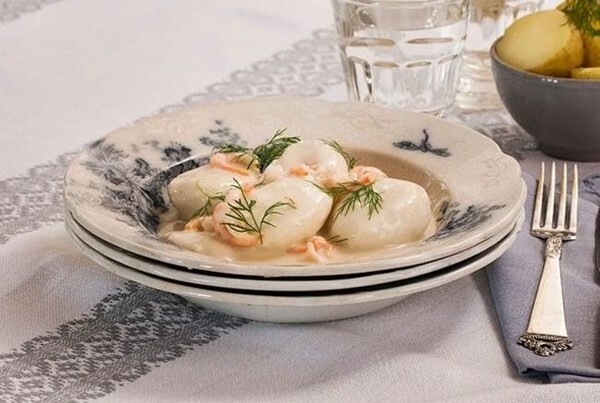 My favorite Norwegian recipe is Fiskeboller (fish dumplings) served in white gravy, steamed potatoes, and vegetables. • Mix all ingredients in a food processor until smooth. • Place in the fridge and leave there for 1-1/2 to 2 hours. • For the dinner party version, add a glass of white wine. • Use two spoons to make the balls (dip spoons in ice water in between each ball). • Slide each ball off the spoon and into the boiling stock. • Boil one at first to see how it turns out. If it falls apart, add more flour. • Boil a few at a time. They are done when they are firm. • Strain the stock and use as a base for the sauce. • Prepare a white sauce from a butter and flour mixture and the stock. • Add curry to the sauce and serve with boiled potatoes and boiled carrots. • For the dinner party version, prepare the sauce with white wine and hold the curry. • Serve with broccoli, potatoes, and slices of lime. Since you’re also well-versed in kitchens themselves in addition to cooking in them, do you have any interior design tips for a kitchen? I love kitchens. They are exciting and vibrant places where you can express yourself in the food that your prepare. 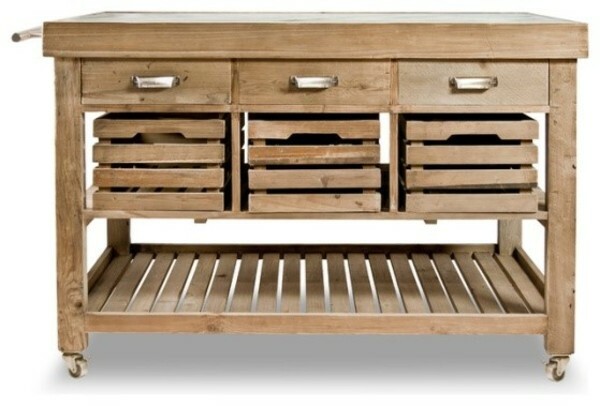 Not only are they a functional heart of the house, but they must look attractive and provide space for storage. The kitchen is one room in your home that can be quite expensive to renovate and redesign; but even if you’re on a small budget, you can make some pretty amazing things happen. If you follow the tips below, you can easily and affordably transform your kitchen into the space that you’ve always wanted it to be. The window treatments in any room have more of an impact than you may first realise. After all, they do draw your attention to the windows when you walk into the room, especially if the windows are quite large. Therefore, simply updating the window treatments, whether you prefer curtains or blinds, is one of the fastest, easiest, and most affordable ways to set the foundation for a kitchen redesign. If your kitchen cabinets are looking dated and are in great need of a makeover, consider repainting them rather than totally replacing them. This will save you a lot of money and still give you the desired look of a new set of cabinets. All you have to do is remove the cabinet doors, repaint them and the sides of the cabinets that are still on the walls, and then reinstall the doors after everything has dried. White is a hugely popular and very trendy kitchen colour today, but you can go with any colour that you think will fit the space best. Old fluorescent light fixtures that give off a yellow glow in your kitchen will make it feel dated and drab, so update the lighting throughout the space. You can, for example, add a hanging light fixture over your sink or your kitchen’s island, as well as install new lighting over your kitchen table. Add bright LED light bulbs that will bring out all of the colors throughout the room in their true brilliance. Another way that you can redesign your kitchen very easily is by simply repainting the walls. If your walls are currently a boring off-white or white colour, experiment and have a little bit of fun with bright, bold colours to switch things up and give the room a whole new vibe. Just make sure that whatever colour you choose will match the cabinets as well. If you have an eat-in kitchen, another focal point is your table and chairs; so if you’ve had the same set for many years, it’s likely that it’s out of style by now. Upgrade to a new set, whether you prefer a large wooden table or a glass-top option. These are just a few of the many affordable ways that you can redesign your kitchen if you’re on a budget but you really want to transform the look and feel of the room. With a little bit of creativity and the right supplies, you can get a lot done with just a small amount of money, and you’ll love the results in the end. It has to be knives I bought from Italy years ago. They’re absolutely amazing. I have bought, tested, and tried many knives over the years, but I always go back to them because they’re really good! If someone were to buy you a gift for your kitchen and money were no object, what would you want?